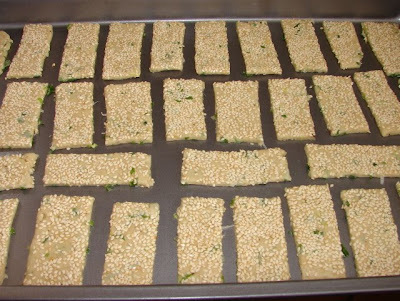 This morning I suddenly have a craving for some Pop Pan spring onion crackers, I was too lazy to go down to the shop. I thought of making something similar. I had a tub of chicken stock jelly with fat collected from roasting a chicken. Thought it might be a good idea to use that to flavour these crackers. No sure how this concoction would turn up I just mixed the dough, rolled it out and baked it. To my pleasant surprise the crackers are rather nice. So here is to share with you the recipe. I am still munching some as I write this. 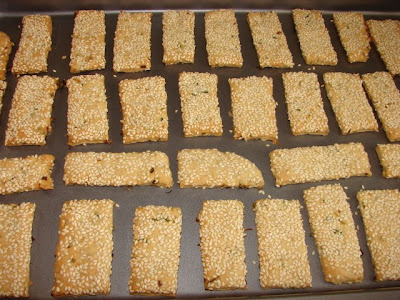 Dry roast the sesame seeds with a dry frying pan till light golden brown. Leave aside to cool. Mix plain flour, baking powder, chicken stock powder and ground pepper together. Rub chicken fat and butter into the dry ingredients evenly. Mix in chopped spring onion. Leave for a little while to let the dry ingredient to absorb the moisture from the spring onion. Then add chicken stock jelly a little at a time into the mixture till crumbs bind together forming a dough. Leave to rest for 10 minutes. Dust working areas with flour. 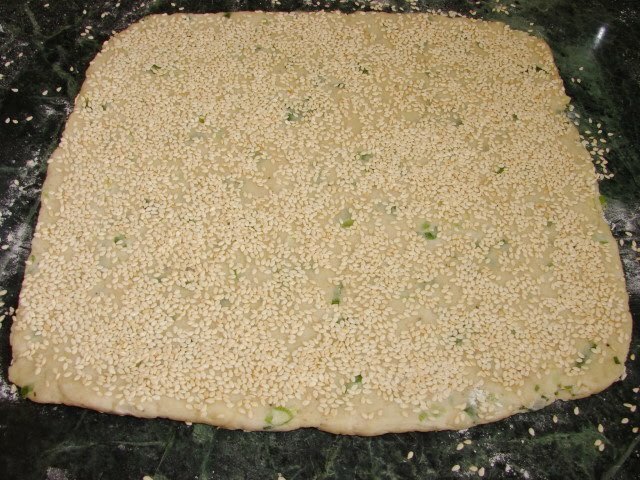 Roll the dough to a square or rectangle to about 4 cm thick. Brush the dough surface very very lightly with water. Must not be too wet. 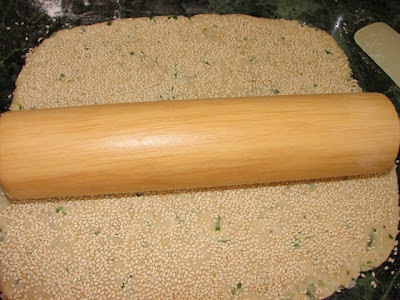 Then sprinkle the surface generously with sesame seeds. 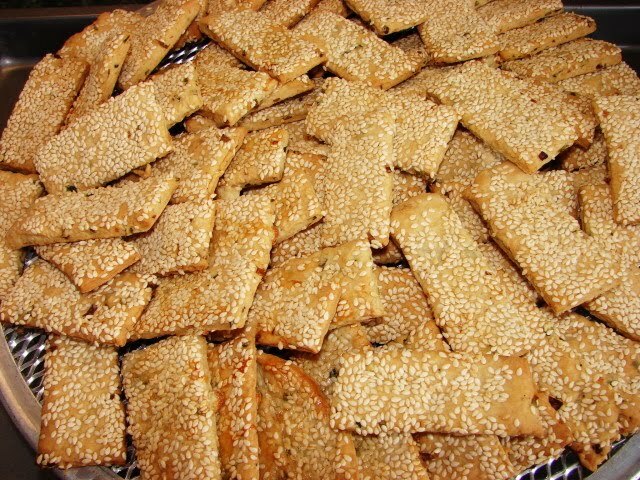 Press the seeds down with fingers avoiding sesame seeds sticking back on fingers. Then roll and press dough with rolling pin so sesame seeds are ingrained into the dough and dough becomes quite thin about 2 - 2.5mm thick. Cut into any shape and size you like. I cut it into 3 x 7cm strips. Carefully lift up pastry and place on baking sheet (pan). Bake at preheated oven (200 deg C fan oven) for about 12 minutes or till golden brown and crisp. Thanks for sharing your lovely crackers. Brilliant - I too love those Pop Pan crackers! What a great looking recipe too. I love the line, 'I was too lazy to go to the shop'! The shop must be far far away! 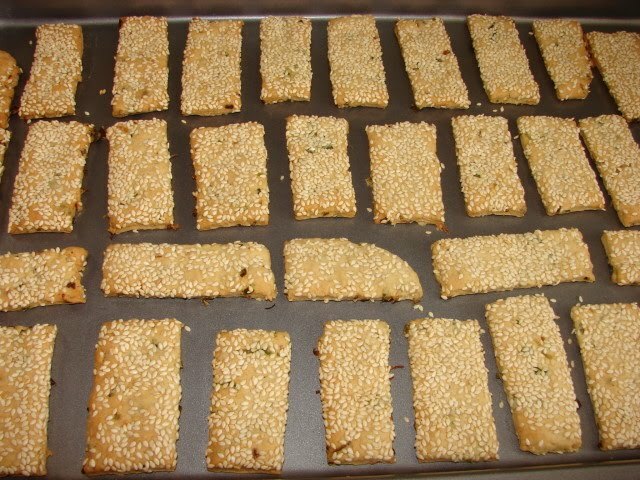 These turned out really well and I now have a craving for these crackers. Wowza. These look and sound awesome. I love Pop Pan!